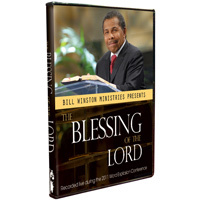 In this special single MP3 teaching from this year’s Word Explosion Conference, Dr. Bill Winston sets the record straight and answers all of your questions concerning the goodness and power of the Blessing of The Lord! Learn how the Blessing is bestowed upon you, why you need the Blessing of the Lord and most importantly how to get the Blessing of The Lord working in your life right now! Visit our website and download your copy today.